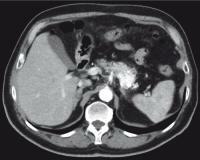 A 77-year-old man was referred to our hospital for further evaluation of a symptomatic pancreatic mass. Almost a year before, he had experienced low back pain with irradiation to the left flank. Ultrasonography showed a hypoechoic mass at the pancreatic tail. He had no relevant past history, such as abdominal trauma, pancreatitis or other congenital abnormalities. His physical examination and laboratory test results were normal. Computed tomography (CT) revealed the presence of a nodular neoformation in the pancreatic tail, which was hyperintense in the arterial phase ([Fig. 1]). 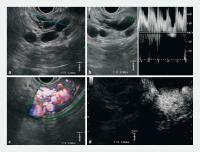 A neuroendocrine tumor was suspected and endoscopic ultrasound (EUS) was performed. Fig. 1 Nodular neoformation in the pancreatic tail, which was hyperintense in the arterial phase. 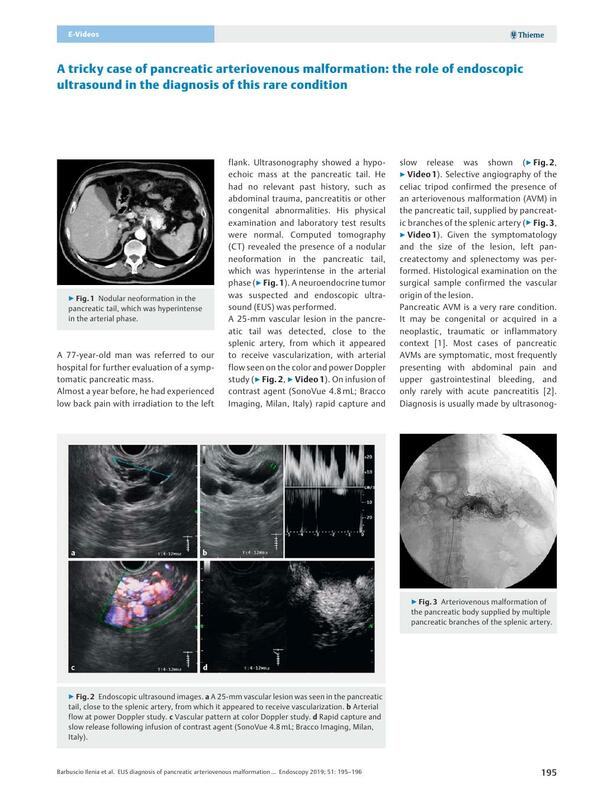 A 25-mm vascular lesion in the pancreatic tail was detected, close to the splenic artery, from which it appeared to receive vascularization, with arterial flow seen on the color and power Doppler study ([Fig. 2], [Video 1]). On infusion of contrast agent (SonoVue 4.8 mL; Bracco Imaging, Milan, Italy) rapid capture and slow release was shown ([Fig. 2], [Video 1]). 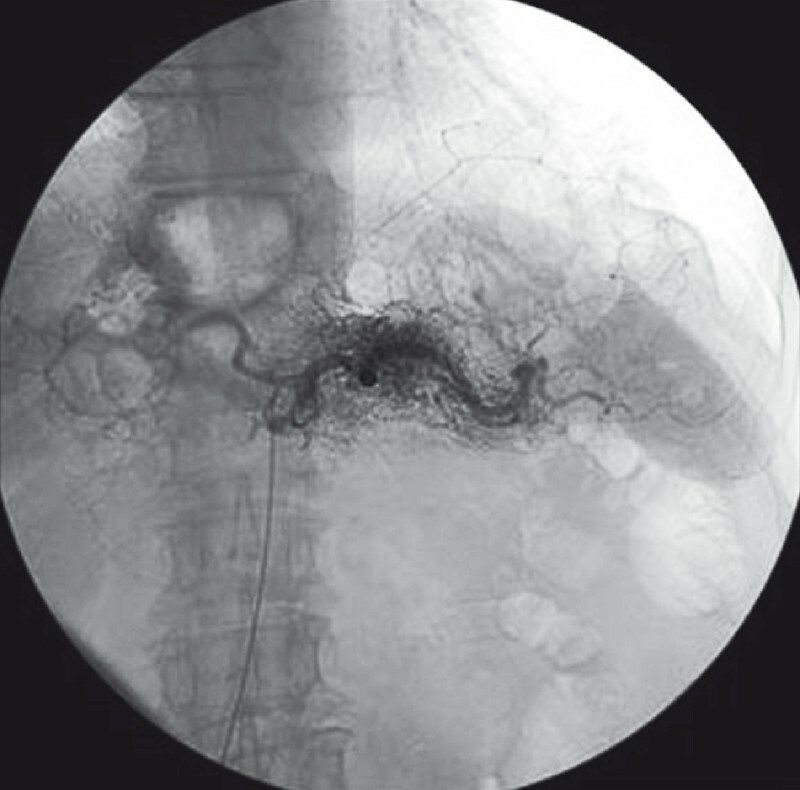 Selective angiography of the celiac tripod confirmed the presence of an arteriovenous malformation (AVM) in the pancreatic tail, supplied by pancreatic branches of the splenic artery ([Fig. 3], [Video 1]). Given the symptomatology and the size of the lesion, left pancreatectomy and splenectomy was performed. Histological examination on the surgical sample confirmed the vascular origin of the lesion. Fig. 2 Endoscopic ultrasound images. a A 25-mm vascular lesion was seen in the pancreatic tail, close to the splenic artery, from which it appeared to receive vascularization. b Arterial flow at power Doppler study. c Vascular pattern at color Doppler study. d Rapid capture and slow release following infusion of contrast agent (SonoVue 4.8 mL; Bracco Imaging, Milan, Italy). Video 1 Endoscopic ultrasound examination with Doppler study and contrast-enhanced evaluation followed by angiographic study confirmed the presence of a pancreatic arteriovenous malformation. Fig. 3 Arteriovenous malformation of the pancreatic body supplied by multiple pancreatic branches of the splenic artery. Pancreatic AVM is a very rare condition. It may be congenital or acquired in a neoplastic, traumatic or inflammatory context . Most cases of pancreatic AVMs are symptomatic, most frequently presenting with abdominal pain and upper gastrointestinal bleeding, and only rarely with acute pancreatitis . Diagnosis is usually made by ultrasonography, CT, magnetic resonance imaging, and/or angiography . The differential diagnosis is primarily hypervascular tumors such as islet cell tumor, neuroendocrine tumor, and hypervascular metastases . In our case, EUS, which is not commonly performed in this condition, allowed the diagnosis to be made.